Kate Chopin Tussles with a Novel Ending – Now Available! I’m very pleased to announce that my historic short story “Kate Chopin Tussles with a Novel Ending” has been published in Fault Lines: Stories by Northern California Crime Writers. My “Kate Chopin Tussles with a Novel Ending” is one of the “beyond” Northern California stories, and examines fault, blame, and guilt in late 19th century Louisiana. 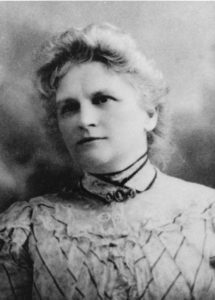 Although Kate Chopin’s novel The Awakening is celebrated today as a declaration of female sexual independence, when it was first published in 1899 it was scorned, derided, and deemed vulgar. What, I wondered, would have happened if author Kate were confronted by one of her early readers? A reader who—like Kate’s protagonist Edna—had her life changed forever by her sudden sexual independence? But a reader who—unlike Edna—would stop at nothing to blame Kate for where that independence lead her. Writer or reader, it’s not always easy to know who’s really at fault. For those of you keeping chronological score, “Kate Chopin Tussles with a Novel Ending” takes place in 1899, ten years after my Gilded Age New Orleans novel Fanny Newcomb and the Irish Channel Ripper. I hope that you enjoy both of these Gilded Age Louisiana stories about ambitious and intelligent women.